Cracksman was awesome, Roaring Lion was fabulous…but it’s done, finito-ed, end of, switch the lights off. You can take a small break to watch/punt on the Breeders Cup but that’s it. No more! No distractions from here on in as from this weekend on-wards we are rolling in the National Hunt stuff! Rolling right down deep in the good stuff! Well, bouncing off it is more the case right now but you get me! Cheltenham’s Showcase meeting on Friday and Saturday and then Aintree’s Old Roan Chase meeting on Sunday! It’s what we’ve all been waiting for! Get switched on now as this sh!t is about to get real!! We are likely to see more and more of the big guns hitting the track in the coming weeks (providing those rains start to come!) and that’s nothing if not a fantastically exciting thought. Making sure my head is fully in top gear and prime shape for the 2018/19 season has also meant I’ve had my head stuck deep in my own personal stash of horse notes for a considerable amount of time (not sure exactly how long but I need a haircut and my beard needs a decent trim…according to Mrs NTF anyway!! ), meaning those notes are sharpened to within an edge of their pretty little lives! It’s vital to me making this game pay that my notes are up to scratch and although it means plenty of late nights and hours stuck in front of my computer screen, it’s well worth it. The ducks need to be in line before the season is in full swing and as it stands I’m more than happy with the line my ducks are making!! A couple of them look a bit lame but I’ll have them straightened out by the weekend, mark my words! If I can’t straighten them out I’ll give them a peaceful send off, I’m not cruel! I’ve already supplied you guys with five of those types although none have made an appearance on the racetrack just yet, but that’s cool, that means they are all still live bullets waiting to be fired. 20th Jan 2018 – (*One to follow) He was held up right at the back in this and it was always going to be difficult to make up ground over 2m in these conditions (Heavy). He did finish well, making up a serious amount of ground over the last 2, and I suspect he’ll be better suited to longer trips in time (2m4f+). His current mark of OR 108 should be some way below his ceiling. What I didn’t add in that note was that I also thought he shaped as one that was likely to improve for going chasing. Something he’ll potentially be doing this Thursday (25th October) at Southwell, as he entered in the Novices’ Handicap Chase at 2.20 (5 day decs, obviously). Win, lose or draw in that contest (if he takes up the engagement) he looks one that could have a fair few pounds to play with at present as once the penny fully drops with him (which it hadn’t really last term) he should prove some way better than his current mark of OR 107. We’ll know more about him after we’ve seen him run this season but I will be shocked should fences not see him leave his current mark some way behind. The 7yo never really got himself going at any stage last season, pulling in a form line of 8-3-P-6-8-6 from his 6 starts and seeing his handicap mark drop from a starting 154 down to it’s current perch of 146. In fairness to him he did take on plenty of tough assignments (Future Stars Chase against Might Bite, Ladbroke Trophy, Betdaq Handicap Chase at Kempton, Scottish National…) and he may simply have been out of his depth and/or too high in the handicap. His current mark of OR 147 should allow him to be more competitive this time round and it may be a case of having one target in mind and going all in for that prize, any victory he gains is likely to whack him back up the handicap and put him back on a mark he struggles from. On the conditions front I’d be relatively flexible as there was something in his 6th place finish in the Scottish National that just made me think he may be growing into his stamina boots as he matures. Still lightly raced despite being an 8yo, with only 5 chase starts and 13 total career starts on his CV to date. He had an in and out kind of season last term but he did find the winners enclosure twice, both times at Kelso over the 2m7.5f trip. Five of his six career victories have actually come at the borders track although he doesn’t strike me as a one track pony. 13th Jan 2018 – Seemed to get taken off his feet mid-race and I suspect he a staying handicap chaser in the waiting. OR 144 maybe doesn’t give him all that much wiggle room but he may go down a couple for this effort. His best effort to date came over 3m2f on Heavy (which he won by 10L) and it’s not hard to see something like the Welsh National or Classic Chase at Warwick as future targets for him or even the Haydock Grand National Trial that the yard won with Silver By Nature a couple times in the past. He did finish off his season in Handicap company (Novice Handicap) running a solid second behind the Harry Fry trained Behind Time at Uttoxeter, giving that one a rather lumpy 23lbs. 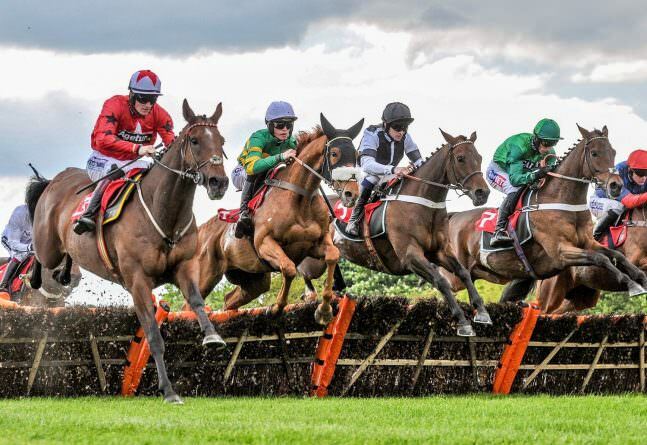 His final three starts of the season all suggest he has the potential to be a high 140’s/low 150’s handicapper and with his novice season in the bag and some much needed jumping experience on the dance-sheet it would be no surprise to see him pop up in a staying handicap somewhere. Doors to the full NTF National Hunt service are now OPEN! This French bred youngster wasted no time in opening his account when switched to chasing last November, winning his chase debut by a thumping 17L at Chepstow. He backed that run up with a solid second in open handicap company at Fontwell before again demolishing the opposition back against novices at Chepstow in January. The handicapper over-reacted somewhat to that second win, pumping him 11lbs in the handicap to OR 148 and he spent his next three starts overrated and over-faced for that stage of his career, taking in a Graduation Chase at Exeter and two competitive Handicaps at Cheltenham. Thankfully the handicapper relented fairly quickly and he now finds himself back on the much more workable mark of OR 141. 19th Jan 2018 – Seems to really love Heavy (1212 on Heavy – 236234 all other ground) and indeed Chepstow (211 – both wins over fences). He’s turned into a significantly better chaser than he was hurdler and he should be interesting for deep ground handicaps next season. ...and whilst I would still have Heavy ground as his absolute prime ground it would be foolish to rule him out when the ground is also riding Soft (only 1 start on Soft to date). Whether he turns out to be good enough to win a race as competitive as the Welsh National is debatable at this stage but it's not hard to envisage him running well in races such as the Chepstow showpiece and some of the Heavy ground Haydock handicaps we will get during the depths of winter. I wouldn't expect to see this one until the ground starts to open up and gets a good battering from the elements, given both his wins over obstacles have come when the ground has been riding heavy. After a pipe-opener at Warwick over 2 miles (finished a well-beaten 4th of 5) he was then fired into open handicap company at Lingfield where he promptly romped home by an impressive 7L, a race where he could probably have been called the winner from some way out. He was then tried in the Class 2 Tommy Whittle Handicap at Haydock on his next start but he unsurprisingly found that too hot on only his 3 start over the larger obstacles. After that he was dropped in trip for a Novice Handicap at Cheltenham and sent up in grade for a pop at the RSA Chase at the festival, both races he ended up well-beaten in. Personally I think the campaigning of him left a little to be desired but on the plus side he should have picked up plenty of experience from those outings and he's also starting this season on a mark he should be able to be competitive off (OR 135). He's unlikely to be the kind to run up a sequence of victories but it would be no surprise to see him scooting up in a deep ground Handicap Chase somewhere, before the handicapper has another say in matters. On a slightly side note, although sticking with Emma Lavelle, Full Irish actually came to my attention when he was a qualifier on a mini-angle I have for the trainer, one that looks at those trainers that excel with unexposed handicap chasers (like the guide I just released to the free NTF list). A bit niche, I know, but robust and profitable none-the-less. With regards to the bulk of this post, however, I'd be extremely hopeful that these five horses can pick up handicap pots at some stage during the 2018/19 campaign and prove to be better than their current marks in the process. Hi Ben,just a few of my horses to keep an eye on. GRAND SAUNCY-P Nicholls,won at Chepstow,went from last to 1st in a couple of furlongs,looks improved. DUC DE BEAUCHEME-D Pipe,ran well at Chepstow,not knocked about,classy individual,will win soon. Nicholls horse certainly looks a stronger proposition this season round. Last run at Kempton was a farce on the pace front but was certainly impressive on seasonal debut at Chepstow. More to come in handicaps I suspect. Definitely be an interesting runner if he takes up the engagement. NTD had 4 runners in the race previously and they finished 1-3-5-2. Think on his day he’s more than capable.on a line through the favourite he has a chance at the weights. Yes, he wouldn’t be the first horse to suffer a bit in his first season out of the novice ranks (like he did last year) and then come back stronger the season after.